When we heard CADS were taking over the Abbeydale Picture House we couldn’t wait for the space to start being used for gigs. We thought we’d head down to the debut gig at the space – put on by Hop Hideout, Inner City Weddings and DJ Lubi – to see if it lived up to expectation. Finally! The Abbeydale Picture House is being used for gigs! 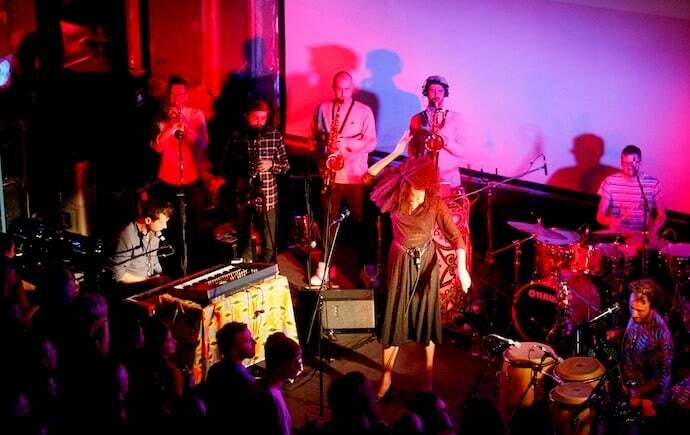 And who better to kick things off than Leeds born, London based musical collective, Nubiyan Twist. A truly eclectic band with a proper party starting attitude, the Twist strolled on stage with an understated confidence, and started their set slowly, drawing in the crowd with some light funky jazz. Lead singer Nubiya Brandon nervously sipped from a hip-flask, flailing her arms to the sporadic horn stabs while the tight rhythm section found their groove. Before long the band hit their stride, and a large crowd formed down the central aisle and scattered amongst the front rows of the former cinema. The crowd was indeed spread out, and while this felt odd at first, it quickly became clear that people were enjoying having the room to properly dance. Call me an old man but it was nice to have somewhere to stick your coat, and not have to worry about losing your mates in the crowd. The band’s secret weapon appears to be Oliver Campbell on keys, who artfully coloured the band’s beats over the night, before stepping things up a gear with some energetic synth riffs that bordered on Kaytranada-esque pop. This direction was not dwelt on – the Twist moved quickly into some loose hiphop and heavy dub, before flying through the home stretch with some fiery funk and afro-beat. All in all, Nubiyan Twist put on an extremely promising first gig for the APH, showing the potential of the space and energy and wide tastes of the Nether Edge crowd. Band leader Tom Excell finished the gig by telling the audience that “you can dance a lot better than Londoners”, drawing a huge cheer they will have heard in Tottenham. We look forward to future gigs at the space!